The Suez Crisis The 1956 Suez Crisis is one of the most important and controversial events in British history since the Second World War. 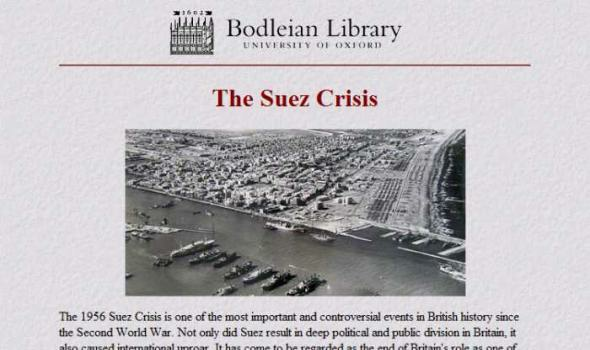 Not only did Suez result in deep political and public division in Britain, it also caused international uproar. It has come to be regarded as the end of Britain's role as one of the world powers and as the beginning of the end for the British Empire. In future British foreign policy would be conducted in concurrence with American diplomatic support. This special online exhibition has been developed to mark the fiftieth anniversary of the Crisis. The exhibition draws from the Bodleian's rich holdings of modern political papers to provide an 'insider's viewpoint' of Suez from politicians, diplomats, civil servants and leading public figures. It includes items from a number of collections which have been acquired within the last decade or so. The Library is grateful to the copyright owners of the material featured without whose support this online exhibition would not have been possible. Matthew Neely ( matthew.neely@bodleian.ox.ac.uk ) October, 2006. 26 July 1956 The Egyptian President, Colonel Gamal Abdel Nasser, announces the Egyptian nationalisation of the Suez Canal and its operating Suez Canal Company in retaliation to the reneging of an agreement by the American and British Governments to finance the construction of the Aswan Dam. The Suez Canal represented the main source of supply of oil for Britain and France and the potential loss of those supplies represented an economic threat that they could ill ignore. 27 July The British Prime Minister, Sir Anthony Eden, forms the Egypt Committee, consisting of himself, Lord Salisbury (Lord President of the Council and Leader of the House of Lords), Lord Home (the Commonwealth Secretary), and Harold Macmillan (the Chancellor of the Exchequer) to co-ordinate Britain's intent to recover her access to the Suez Canal. The Foreign Secretary, Selwyn Lloyd and the Defence Minister Sir Walter Monckton were later members of the Egypt Committee. 16-23 August A conference of nations meets in London in an attempt to find a diplomatic solution and adopts eighteen proposals which include an offer to Nasser of Egyptian representation on the Suez Canal Company board and a share in its profits. 3-9 September The Australian Prime Minister, Sir Robert Menzies, travels to Cairo to offer Nasser the eighteen proposals which he rejects. Meanwhile, the US Secretary of State, John Foster Dulles, seeks to distance the US Government from support for military intervention, ever mindful of President Eisenhower's hopes for re-election in the November US Presidential election. 19-21 September A second conference of nations is held in London to discuss American proposals for a Suez Canal Users Association to ensure continued international use of the Canal. 13 October The USSR vetoes the American plan in the United Nations Security Council. 14 October Sir Anthony Eden holds secret discussions with French officials over a military operation to recover use of the Canal. The talks result in the formation of a plan by which Israel would invade Egypt and thus allow British and French forces to seize the Canal as an act of intervention between warring nations. 22-24 October The British Foreign Secretary, Selwyn Lloyd, concludes the agreement with French and Israeli officials at Sèvres, France. The British copy of the resulting Sèvres Protocol is subsequently destroyed on Eden's orders. 25 October Eden gains approval for military intervention from a divided cabinet. An increasingly sidelined Foreign Office is split over the Government's intention to adopt military measures. 29 October Israeli forces invade Egypt. 30 October The British and French ultimatum for an end to hostilities is rejected by Nasser. 5-6 November On the night of 5-6 November, British and French troops invade Port Said and take control of the Suez Canal. In a meeting of the British cabinet on 6 November, Harold Macmillan raises stark warnings of economic peril as a result of the action. Macmillan had previously been one of the strongest supporters of resolute action. The US Presidential election results in the re-election of President Eisenhower. 7 November The United States, USSR and the United Nations condemn British and French military action. The loss of confidence and American backing for the already weak British economy forces Eden into calling a cease-fire. British public opinion is deeply divided over the use of force. 9 January 1957 Under the impact of the Crisis, Eden's already fragile health has deteriorated to such an extent that he is forced to resign. Ill health or not, politically Eden's premiership had little future. 10 January Harold Macmillan replaces Eden as Prime Minister. Harold Macmillan diary entry, 27 July 1956. MS. Macmillan dep. d. 27, fols. 9r, 10r, 11r. William Clark diary entry, 13 Aug. 1956. MS. Eng. c. 4806, fols. 114-15. Patrick Reilly memoir, Aug. 1956. MS. Eng. c. 6921, fol. 321. Roger Makins memoir, Sept. 1956. MS. Sherfield 957. Walter Monckton minute, Sept. 1956. Dep. Monckton 7, fols. 175-7. Walter Monckton draft resignation letter, 24 Sept. 1956. Dep. Monckton 7, fols. 210-11. Donald Logan memoir on Sèvres, 22-25 Oct. 1956. MS. Eng. c. 6168, fols. 4-11. Paul Gore-Booth minute, 2 Nov. 1956. MS. Gore-Booth adds. 10/1, fol. 4r-v. Paul Gore-Booth letter to mother, 3 Nov. 1956. MS. Eng. c. 4599, fols. 12r-13v. William Clark diary entry 4-5 Nov. 1956. MS. Eng. c. 4806, fols. 179-80. Walter Monckton - aerial photograph of Port Said, Nov. 1956. Dep. Monckton 8*, fol. 5. Gilbert Murray draft letter to Time and Tide , 6 Nov. 1956. MS. Gilbert Murray 111, fols. 215-6. Violet Bonham Carter letter to Gilbert Murray, 30 Nov. 1956. MS. Gilbert Murray 121, fols. 219-220. Photograph of Harold Macmillan and Lady Dorothy Macmillan outside 10 Downing Street, Oct. 1957. MS. Macmillan dep. c. 1032, fol. 59. Sir Geoffrey De Freitas Paul Gore-Booth, Baron Gore-Booth Sir Donald Logan Harold Macmillan, 1st Earl of Stockton Enquiries regarding the collections should be addressed to Enquiries.SC@bodleian.ox.ac.uk .